Thirteen Days is a 2000 American historical political thriller film directed by Roger Donaldson. It dramatizes the Cuban Missile Crisis of 1962, seen from the perspective of the US political leadership. Kevin Costner stars as top White House assistant Kenneth P. O'Donnell, with Bruce Greenwood featured as President John F. Kennedy, Steven Culp as Attorney General Robert F. Kennedy, and Dylan Baker as Secretary of Defense Robert McNamara. While the film carries the same title as the book Thirteen Days by former Attorney General Robert F. Kennedy, it is in fact based on a different book, The Kennedy Tapes: Inside the White House During the Cuban Missile Crisis, by Ernest May and Philip Zelikow. It is the second docudrama made about the crisis, the first being 1974's The Missiles of October, which was based on Kennedy's book. The 2000 film contains some newly declassified information not available to the earlier production, but takes greater dramatic license, particularly in its choice of O'Donnell as protagonist. It received generally positive reviews from critics who praised the screenplay and performances of the cast but was a major box office failure grossing $66.6 million against its $80 million budget. In October 1962, U-2 aerial surveillance photos reveal that the Soviet Union is in the process of placing intermediate-range ballistic missiles carrying nuclear weapons in Cuba. President John F. Kennedy (Bruce Greenwood) and his advisers must come up with a plan of action to prevent their activation. Kennedy is determined to show that the United States will not allow a missile threat. The Joint Chiefs of Staff advise immediate U.S. military strikes against the missile sites followed by an invasion of Cuba. Kennedy is reluctant to attack and invade because it would very likely cause the Soviets to invade Berlin, which could lead to an all-out war. Citing The Guns of August, Kennedy sees an analogy to the events that started World War I, where the tactics of both sides' commanders had not evolved since the previous war and were obsolete, only this time nuclear weapons are involved. War appears to be almost inevitable. The Kennedy administration tries to find a solution that will remove the missiles but avoid an act of war. They settle on a step less than a blockade, which is formally regarded as an act of war. They settle on what they publicly describe as a quarantine. They announce that the U.S. naval forces will stop all ships entering Cuban waters and inspect them to verify they are not carrying weapons destined for Cuba. The Soviet Union sends mixed messages in response. Off the shores of Cuba, the Soviet ships turn back from the quarantine lines. Secretary of State Dean Rusk (Henry Strozier) says, "We're eyeball to eyeball and I think the other fellow just blinked." The administration continues to order spy plane pictures, but one of Kennedy's top advisers, Kenny O'Donnell (Kevin Costner), calls the pilots to ensure the pilots do not report that they were shot at or fired upon, because if they were, the country would be forced to retaliate under the rules of engagement. John A. Scali, a reporter with ABC News, is contacted by Soviet "emissary" Aleksandr Fomin (Boris Lee Krutonog), and through this back-channel communication method the Soviets offer to remove the missiles in exchange for public assurances from the U.S. that it will never invade Cuba. A long message in the same tone as the informal communication from Fomin, apparently written personally by Soviet Premier Nikita Khrushchev, is received. This is followed by a second, more hard line cable in which the Soviets offer a deal involving U.S removal of its Jupiter missiles from Turkey. The Kennedy administration interprets the second as a response from the Politburo, and in a risky act, decides to ignore it and respond to the first message, assumed to be from Khrushchev. There are several mis-steps during the crisis: the defense readiness level of Strategic Air Command (SAC) is raised to DEFCON 2 (one step shy of maximum readiness for imminent war), without informing the President; a nuclear weapon test proceeds (Bluegill Triple Prime) and a routine test launch of a U.S. offensive missile is also carried out without the President's knowledge. In a bid for time while under intense pressure from the military for an immediate strike, President Kennedy authorizes attacks on the missile sites and an invasion of Cuba, to commence the following Monday. An Air Force U-2 reconnaissance plane is sent over Cuba to gather intelligence for the attack, but is shot down, killing the pilot. After much deliberation with the Executive Committee of the National Security Council, Kennedy makes a final attempt to avoid a war by sending his brother, Robert F. Kennedy (Steven Culp), to meet with Soviet ambassador Anatoly Dobrynin on Friday night. Bobby reiterates the demand that the Soviets remove their missiles from Cuba, and in return promises not to invade or assist in the invasion of Cuba. Dobrynin insists that the U.S. must also remove all Jupiter missiles from Turkey, on the border of the Soviet Union. Bobby says that a quid pro quo is not possible, but in exchange for Khrushchev removing all the missiles from Cuba, there will be a secret understanding that the U.S. will remove all of its "obsolete" missiles from Turkey within six months as part of a pre-scheduled plan. The Soviets announce on Sunday that they will remove their missiles from Cuba, averting a war that could have escalated to the use of nuclear weapons. The film ends with President Kennedy dictating a letter of condolence to the family of the reconnaissance pilot, Rudolf Anderson, who was shot down over Cuba as part of the preparations for the invasion, and the Kennedy brothers and O'Donnell outside of the Oval Office as actual audio of President Kennedy's commencement speech at American University played in the background. Madison Mason as Chief of Naval Operations Admiral George Whelan Anderson Jr.
Oleg Vidov as Valerian Zorin, Soviet Ambassador to the United Nations. Christopher Lawford as RF-8 Crusader pilot, Commander William Ecker, USN. The film was co-produced by several studios, including New Line Cinema, Costner's Tig Productions and Armyan Bernstein's Beacon Pictures. The Department of Defense cooperated to some extent, allowing the producers to film on several bases. In order to keep the film "in period" filming took place on ships from the time of the crisis that still existed in the active fleet (USS Enterprise), and ships preserved as museums (USS Joseph P. Kennedy, Jr.). Aircraft (both a preserved F-8 Crusader and Lockheed U-2 spyplane were featured) that still exist from the period were refurbished to appear operational as well. The RF-8 Crusader (and an F-5) plus the scenes of Cuba were shot in the Philippines. The air base scene was taken at Clark Air Base, Philippines a former American facility, which substituted for NAS Key West, Florida, where the actual RF-8As of Light Photographic Squadron SIX TWO (VFP-62) launched from on their Cuban overflight missions. At the time of the shooting, the F-8 was still in the inventory of the Philippine Air Force, but no longer operational. The F-5s were retired in 2005. The film was given a limited theatrical release on Christmas Day 2000, and a wide release on January 12, 2001, with a staggered release to various countries throughout most of the year. The film grossed $66,579,890 worldwide against a production budget of $80 million. Rotten Tomatoes reports that 83% of 117 critics have given the film positive reviews, with an average rating of 7.2/10. The website's consensus states: "Thirteen Days offers a compelling look at the Cuban Missile Crisis, and its talented cast deftly portrays the real-life people who were involved." Metacritic, which assigns a rating out of 100 to reviews from mainstream film critics, gives Thirteen Days a score of 67, based on 13 reviews, indicating "generally favorable reviews". Audiences surveyed by CinemaScore gave the film a grade A-. Roger Ebert of the Chicago Sun-Times gave Thirteen Days a rating of 3 stars out of 4, and said "The movie's taut, flat style is appropriate for a story that is more about facts and speculation than about action. Kennedy and his advisers study high-altitude photos and intelligence reports, and wonder if Khrushchev's word can be trusted. Everything depends on what they decide. The movie shows men in unknotted ties and shirt-sleeves, grasping coffee cups or whiskey glasses and trying to sound rational while they are at some level terrified...[T]hings might not have happened exactly like this, but it sure did feel like they did." For God's sakes, Kenny O'Donnell didn't have any role whatsoever in the missile crisis; he was a political appointment secretary to the President; that's absurd. I think it's an absolutely fascinating portrayal and a very constructive and responsible portrayal of a very, very serious crisis not only in the history of this nation but in the history of the world. Costner traveled to Cuba in 2001 to screen the film for Fidel Castro, saying at a press conference, "It was an experience of a lifetime to sit only a few feet away from him and watch him relive an experience he lived as a very young man." The DVD & VHS was released on July 10, 2001. The DVD release marked the debut for New Line's Infinifilm label. ^ "Thirteen Days (12)". British Board of Film Classification. December 13, 2001. Retrieved October 12, 2016. ^ a b c "Thirteen Days". Box Office Mojo. Retrieved December 5, 2011. ^ Roger Ebert (January 12, 2001). 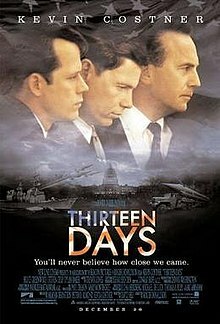 "Thirteen Days Movie Review & Film Summary". ^ Nelson, Michael (February 2, 2001). "'Thirteen Days' Doesn't Add Up". The Chronicle Review. Chronicle of Higher Education: B15. Retrieved December 1, 2013. ^ a b McNamara, Robert (March 2001). https://web.archive.org/web/20010905114944/http://www.pbs.org/newshour/forum/february01/thirteendays3.html "Online NewsHour Forum: Thirteen Days". PBS NewsHour. PBS. Retrieved December 1, 2013. ^ Waxman, Sharon (November 26, 2016). "Fidel Castro Death: 9 Hollywood Stars Seduced by Cuban Leader". TheWrap. Retrieved June 12, 2018.